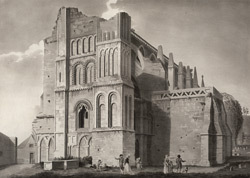 After the abbey was dissolved in the 16th century, two thirds of the buildings disappeared into ruin or were destroyed. However, part of the abbey church nave was later reused as the town's parish church. The abbey's central crossing tower collapsed in the 16th century and around 1662 the west tower had collapsed and destroyed part of the nave.